TRANSLATION: Translator Ian Nicholson /FR. Revised by Renée Sporre-Willes, Raymond Triquet and Claude Guintard. ORIGIN: Northern borders of Mali and Niger; the slopes of the Azawakh valley. UTILIZATION: Sighthound that hunts for game (gazelles, hares, ostriches) and fights off predators (hyenas, jackals, lions). This dog is an important companion for the family life of the nomads, and shares their camp life. Section 2 Short-haired Sighthounds. Without working trial. 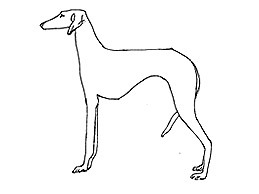 It is an African sighthound descending from the types pictured in the wall paintings of the Central Sahara which date back thousands of years. The ever- increasing aridity of the Sahara caused Tuareg, Dahoussahaq and Peul shepherd-hunters to migrate with their dogs to the more hospitable lands of the Sahel: in areas suitable for farming and hunting along the dry valley of the Azawakh. Belonging to the culture of peoples who domesticated and shaped it, it is known as Oska in the Tuareg language. European enthousiasts discovered the breed with admiration, and selected with the help of the breeders who owned the first lines exported to Europe, as of 1968. Particularly slim and elegant, the Azawakh sighthound gives a general impression of great slenderness. Its bone structure and muscles show through thin and dry skin. It is a slender dog whose body fits into a rectangle with a vertical long side. Height at the withers / Depth of chest: 10-4. Length of head / Length of muzzle: 10-5. Head length / Width of skull: 10-4. Quick, attentive, distant, can be very reserved with strangers, but it can be gentle and affectionate with its family, and people whom it is willing to accept. Long, fine, lean and chiselled, rather narrow, without excess. Skull: Almost flat, rather long, its width should be significantly less than half the length of the head. The line of skull and the bridge of the muzzle are sometimes slightly divergent. The superciliary ridges and the frontal furrow are slightly marked. The external occipital protuberance is clearly pronounced. Nose: Black or dark brown colour is obligatory, the nostrils are well opened. Muzzle: Long, straight, tapered without exaggeration towards the end. Lips: Thin lips tightly fitting, colour is black or dark brown, no hanging lips. Almond eyes, rather large, slightly oblique palpebral opening, colour is dark, sometimes amber, never blue. Eye rims well black or dark brown pigmented. Set quite high. They are fine, always drooping and flat, broad based, lie flat against the cheeks, never "rose ear". The shape is that of a triangle with a rounded tip. The base of the ears pricks up when the sighthound is attentive. Jaws/Teeth: Jaws are long and strong; scissor bite. Complete set of teeth. Neck springing clearly from the shoulders, long, fine and muscular, with upper end slightly arched. The skin is fine and does not form a dewlap. General appearance: Long, thin, vertical. Perfect stand. Shoulder: Long shoulder blade, with dry muscles and only slightly oblique viewed in profile. Upper arm: The scapulo-humeral angle is very open (about 130°). Top line: Straight, approximately horizontal or slightly rising from the withers towards the point of the hips. Hips clearly protruding and placed at the same height or higher than the height of the withers. Croup: Oblique (ideally 45 °). Chest: Deep, well let down almost to the elbows, sternal region gently narrowing. Fore chest fairly narrow. Ribs long, slightly visible, gently and evenly sprung. Underline and belly: The sternal arch is pronounced. The underline rises smoothly into the belly which is tucked up very high. General appearance: Long and lean legs, viewed from behind, perfectly parallel. Thigh: Long with dry protruding muscles. Coxo-femoral angle is very open (about 130°). Stifle (Knee): Femoro-tibial angle is very open (about 145°). Metatarsus (Rear pastern): Tarsus and metatarsus lean, without dewclaws. Forefeet: Rounded, with slender digits, tight and well arched. The pads are pigmented. Hind feet: Rounded, toes well arched, pads pigmented. Set low, long, thin, lean and tapered. Covered with the same type of hair as the body, it often has a white pencil hair on the end. The tail hangs with the tip slightly raised, but it can rise above the horizontal when the dog is excited. Always very supple and with high action when walking and trotting. The gallop is springy. The Azawakh sighthound gives an impression of lightness, even elasticity. The movement is an essential characteristic of the breed. Hair: Short, fine, and down to none on the belly. Fawn, with or without brindles, with white patching limited to the extremities. All shades are admitted, clear sand to dark fawn (mahogany). Brindles should be black as excluding any other shade. The muzzle can present a black mask. White patching: The blaze is very inconstant. On the fore chest, white may be present as white patches, more or less extensively, confined to the base of the neck. The bib should not extend past the point of the shoulder, or go up on each side of the neck. A small white spot on the nape of the neck, of reduced size, is tolerated. As a continuation of the fore chest, white spots can appear below the chest, but must not in any case go up the ribs. Each of the four limbs has a white stocking, at least as a trace on the feet. On a subject having excellent morphology, the lack of white on one limb is allowed. The white marks on the forequarters, often irregular, should not extend beyond the elbows, or encroach on the shoulders. The white marks on the hindquarters, often more regular and less invasive, should not go up to the thigh. White marks appearing on the inner side of the thigh, however, should not be considered a fault. Height at the withers: Males: 64 –74 cm. A margin of 2 cm above and below the standard is tolerated. • Head heavy lacking elegance. • Tail thick and hairy, very curled tail. • Any dog clearly showing physical or behavioural abnormalities will be disqualified. • Overly small chest and extreme general thinness. • Nose, eyelids and lips other than black or dark brown. • Light eyes or blue eyes. • Hips lower than the withers. • Non-accidental anatomical deformation (e.g. : asymmetrical junction of the ribs at the sternum). • Presence of dewclaws or traces of removal of dewclaws on hind legs. • Wired or semi-long coat. • Every dog which shows traces of a surgical intervention meant to correct or repair an esthetical or morphological fault, will be excluded. • Size deviating more than 3 cm. from the standard. • Only functionally and clinically healthy dogs, with breed typical conformation, should be used for breeding. View breed standards for all the Australian National Kennel Council recognised breeds. Looking for an Australian Judge? Search our database of all the national approved judges. Looking for a visiting international judge? Search our database of all visiting judges.